AHMED, Sara (2017) An Untapped Generation: Bringing Millennials Through Your Doors. Paper presented at: IFLA WLIC 2017 – Wrocław, Poland – Libraries. Solidarity. Society. in Session 112 - Poster Sessions. Upper Darby Township and Sellers Memorial Free Public Library, located in Upper Darby, Pennsylvania (United States) is part of a county wide system that includes 29 libraries. 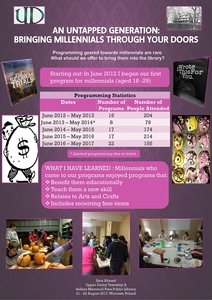 In early 2012 we began to research whether other libraries in the United States were offering programming for millennials. At the time, it was uncharted territory and not many libraries were doing it due to limited attendance when they tried. We became the first library in our county to hold programming for millennials, targeting and limiting attendance to individuals between the ages of 18 and 29. For our pilot program, we decided to hold a book discussion group. The first book discussion group was held in June and was titled ‘Better Than Therapy’ Book group and there was a total of 17 individuals in attendance. Due to the success of the program, we began to offer more programs. Within the first 12 months we offered a total of 16 programs and had a total of 204 attendees. The success of these programs encouraged us to create more programs that varied in nature. To date, we have offered a total of 84 programs and had a total of 876 individuals attend.